This story addresses the moment when the Machines take the reins of the world and mankind is rendered redundant. Within the lifetime of Gloria Weston of the first story robots have gone from her puppy-like paymate Robbie to rulers of the world in place of men. 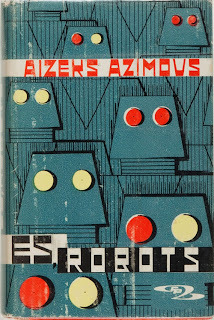 It's not a bloody robot uprising of the the sort depicted in the terrible movie that bears this book's name. Instead, in a move that seems eerily prescient, the robots take control of Earth using the most powerful weapon in the modern arsenal: the economy. Stephen Bryerley (whom we know to be a robot) returns in this story, several years into his term as World Co-ordinator. Asimov imagines a united world orgainsed along a bureaucratic model. Below a single World Co-ordinator sit four Regional Co-ordinators and below them, presumably, sub-regional co-ordinators and managers of state monopolies called things like Consolidated Cinnibar or World Steel. The job of the co-ordinator is to enact instructions devised by the Machines, great positromic brains that control the means of production on behalf of humanity to ensure an equal distribution of resources. Bryerley calls on Susan Calvin to address one last positronic problem - the Machines are making mistakes in their production figures and causing small but significant delays and shortfalls in distribution. Most of the story describes Bryerley visiting each of his regional deputies to quiz them about problems in their area. The quiescent global co-operation is strikingly naive in retrospect of the history of the 20th century. This story was first published in 1950, and Asimov no doubt had the nightmare of WW2 at the back of his mind and saw this technological utopia as mankind's best chance. More striking still is his population projections - the world has just three and a third billion people in Asimov's 2050s, rather than the ten or so billion that looks likely today. The cruise around the world let's Asimov indulge in some broad-strokes characterisation that borders on cultural stereotyping as each of the regional co-ordinators gets chance to explain themselves. He's relatively restrained with the Chinese and African, and we all love a Scots tinkerer of the sort that runs the Northern Region. He gets a little hot under the colour with the insouciant Madame Szegeczowska who runs the European Region. 'What is best for us? Why to be an economic appendage of the Northern Region,' she says. Having interviewed his deputies he opines to Susan Calvin that the Luddite 'Society of Humanity' is behind the disruption, with their agents deliberately disobeying the instructions from the Machines the undermine them. Bryerley describes the Society for Humanity as 'fundamentalist', an interestering use of a word given the religious history of the United States. Indeed, Madame Szegeczowskasays that only the Northern Region could produce an organisation like the Society of Humanity, hinting at a puritan heritage that suggests Asimov is taking a swipe at religion in the Richard Dawkins-style. Calvin scoffs at Bryerley's theory. It's impossible to disobey the machines. They already expect a degree of dissent and allow for it in their commandments. Any action a saboteur took will have been anticipated by the machines and built into the schedule. At the same time, they admit 'accidents' into their data which discredits prominent members of the Society at work in the global bureaucracy leading to their demotion. This has proved only too true in recent years! This story predicts a technological answer to this eternal problem - science, in the shape of the Machine, will save us from the ineluctable whims of forune. That was also the the promise of the big heads on Wall Street and Frankfurt and Hong Kong and the City of London. Their quantitative systems are the conceptual descendants of Asimov's Machines, which ensure the perfect distribution of reources across the world. The Machines are the invisible hand made visible - perfect knowledge allows perfect results. In the real world we've got no reason to believe that a perfect system is even possible. There will always be random, wild elements we can't predict, and that seems to be the blind spot in Calvin's/Asimov's optimism. The stories are convincing but you can't help coming away feeling that there's something missing. Asimov faced this again when J W Campbell talked him into including the Mule in the Foundation stories - the perfect economic and sociological science is impossible to believe in. I started this series pondering the current fashion for describing SF as being in a malaise. Reading these stories underlines one of the causes, I think. When I first read this book, the world of intelligent robots and moonbases didn't seem that far out. A TV show like Space 1999 made sense in a way that no show called Space 2039 could these days. The world changed, and of course rendered yesterday's futures obsolete but without creating new futures. We tend to either see the future as just like today but slightly more tawdry and boring (in the literary mode of Super Sad True Love Story and Here Comes the Goon Squad) or through the lens of genre fantasy - crime, action, even fantasy itself. SF is old. It's ideas are spent. The idea of 'serious' SF addressing futurological ideas for the popular audience assumes that this audience still exists. Science has become too complex for the layman to understand. The technological implications of Higgs Boson seem remote compared to the thrill of the atomic era. The lure of interplanetary travel has dwindled since it's become clear that there's not very much of interest on any planet in the solar system. The laws of physics themselves seem to have drawn a curtain on futurological genres staples like free energy, interstellar travel and artificial intelligence. What is left then? World-building, fandom, the intellectual inbreeding of super-hero comics and never-ending series. Steampunk and alt-historical approaches let us kid ourselves a while that the SF mode is still relevant, but the world's moved on. 'Serious SF' carries on regardless with its Hugos and Nebulas and Arthur C Clarke Awards as if it still had any authority to draw pictures of how the world might be, ignoring the disinterest of the world at large. SF didn't change, the world did. We just haven't come to terms with the fact that the world doesn't need us anymore. ... or as a Kindle ebook. I, Robot - part 6: Liar! Can't think what to get me for Christmas? The header image is by flickr user Paraflyer and used under the provisions of the Creative Commons licence.